Taking the department to the next level: ECE’s 2019 annual magazine features award-winning students and faculty, interactive learning, life-changing research, new startups and invention commercialization, faculty hires, industry connections and alumni accomplishments. 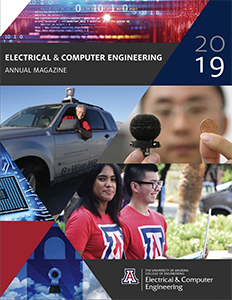 Students, faculty and staff, industry partners, alumni and friends, tell us at communications@engr.arizona.edu about your life, activities and accomplishments. Let your story inspire others!